> First erected in 1910, the Hays Street Bridge has watched modern-day SA grow into what it is today. The Countdown City has gradually spread out and grown taller in front of the bridge's East Side perch between Cherry and Austin Streets, so it makes sense that the span is the best view in the entire city. Standing on the elevated expanse provides a full view of the central city. It gives us a sense of how San Antonio is arranged — from the Alamodome in the east, to the Tower of the Americas, then moving toward the Tower Life Building and the rest of Downtown. It's a complete view from a seldom-seen angle. From the bridge's vantage point, the buildings almost look like models or toys, a view that's reinforced by the vehicles whirring along US 281 in front of the panorama. But the longer you remain on the bridge, and the farther along you walk, the more the city reveals itself to you. North of Downtown, you can see the Pearl and the tower at Trinity University. Temple Beth-El's orange dome looms over the trees in the distance. While you're up there, turn around and inspect each angle it has to offer. You can see how the space is changing, the clearest evidence of which is right underneath the bridge itself. 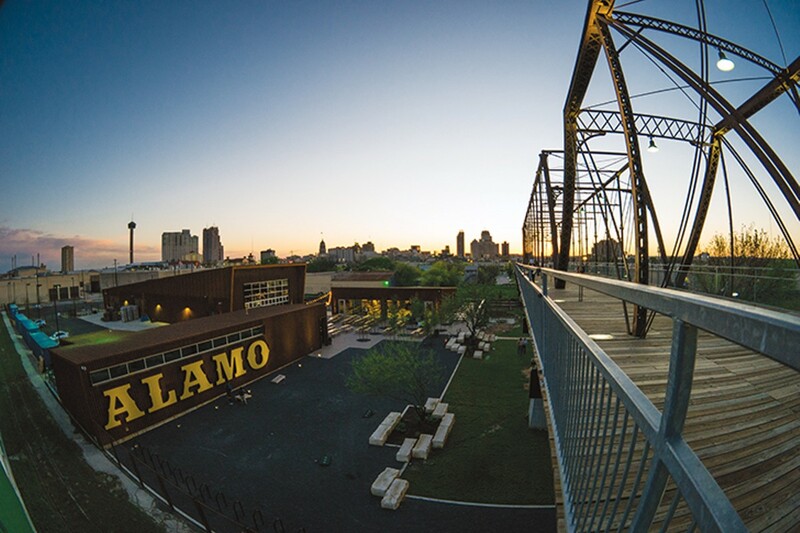 It's all part of taking in the view and of thinking about what San Antonio is becoming.